International borrowing by Chinese nationals has increased rapidly over the past 10 years. Some of this borrowing seems to be motivated by carry trade activities. Regulatory arbitrage may have played a role in this trend. The aftermath of the Global Financial Crisis was characterized by a surge in foreign borrowing by emerging market nationals. Over 2007–2017, outstanding international bonds issued by nationals of developing countries increased from $1.1 trillion to over $3.4 trillion, with annual gross issuances surpassing $1 trillion in 2017 (See Note 1). Nonfinancial corporations played a key role in this surge in international bond issuances, with an increase of total outstanding bonds from $355 billion in 2007 to $1.2 trillion at the end of 2017 (35 percent of the total). Recent research suggests that the increase in corporate debt could become a threat to financial stability in emerging-market (EM) countries (Acharya et al., 2015, Alfaro et al., 2017). There is, in fact, evidence that some corporations are borrowing not to finance investment projects, but to act as shadow banks (Shin and Zhao, 2013; Bruno and Shin, 2016), especially in countries with tighter capital controls and financial regulation (Caballero, Panizza, and Powell, 2015). In this context, China is of particular interest not only because of its highly regulated domestic financial markets and the presence of capital controls (for a survey see Song and Xiong, 2018), but also because international borrowing by Chinese nationals played a key role in the trends documented above. 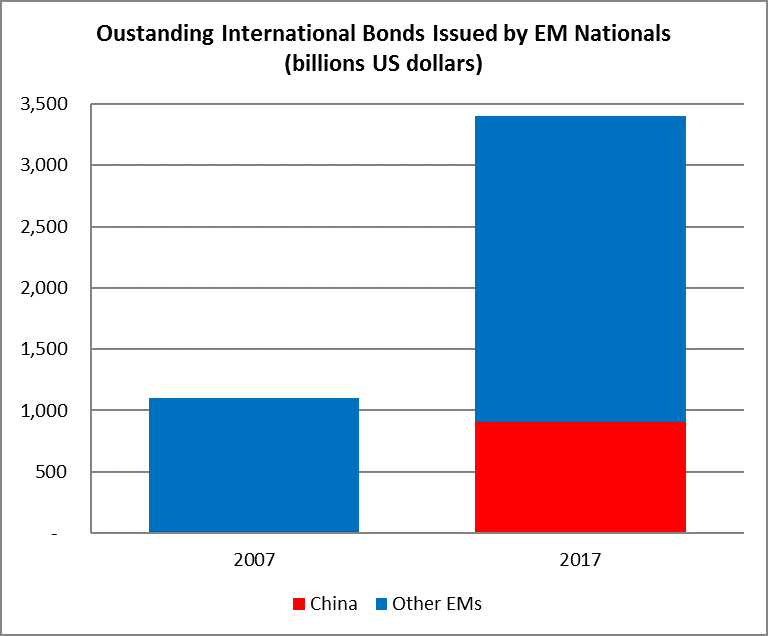 International bonds issued by Chinese nationals represented 3.5 percent of total outstanding international bonds issued by EM nationals in 2007 and are now more than one-quarter of the total (the dollar amount of outstanding bonds went from $20 billion in 2007 to $904 billion at the end of 2017, see Figure). In a recent paper (Huang, Panizza, and Portes, 2018), we show that the pattern of borrowing and the use of borrowed funds differ considerably between Chinese firms that operate in safe economic sectors on the one hand and Chinese firms that belong to risky sectors on the other. Overall, issuers of dollar bonds have lower investment rates, hold more cash, and are more likely to lend to other firms. Profitable firms do not borrow much abroad, and when they do so, they use the funds to finance investment projects. Exporters (i.e., firms that have a natural hedge against currency fluctuations) are less likely to issue dollar-denominated bonds. Moreover, the higher the differential between domestic and foreign interest rates, the more likely risky firms will issue dollar bonds and the less likely exporters and profitable firms will issue dollar bonds. We also show that there is a tight correlation between dollar bond issuances and inter-firm lending for risky firms but no correlation between dollar borrowing and inter-firm lending for firms that operate in safer sectors. These findings are not in line with the hypothesis that firms choose their liability structure to jointly minimize the funding cost and the currency risk. They are, instead, consistent with the hypothesis that riskier firms try to boost profitability by engaging in speculative activities that mimic the behavior of financial institutions and conduct carry trade activities, while escaping prudential regulation that limits risk-taking by highlyleveraged financial firms. This is a form of “shadow banking,” which has so far escaped attention in the study of Chinese financial intermediation. The surge in dollar borrowing by risky nonfinancial corporations may have resulted from regulatory decisions implemented in 2008–2009 which, ironically, intended to reduce the leverage of these firms by limiting their access to domestic funds. In a classic case of regulatory arbitrage, there is evidence that these regulatory policies contributed to the rapid growth of the Chinese shadow banking system. Work by Chen, Ren, and Zha (2018) shows that tighter regulation led to an increase in the share of entrusted loans (a typical shadow banking instrument in China) in total bank lending, and that the majority of these entrusted loans were channeled to firms that operate in risky sectors. In Huang, Panizza, and Portes (2018), we show that the regulatory reforms of 2009–2010 increased the likelihood that risky firms will issue dollar bonds and then use the proceeds to onlend to domestic firms that operate in similar sectors. The rationale for such behavior is that information asymmetries are paramount in the shadow banking system, but these information asymmetries are likely to be less important for firms that operate in the same sector. Hence, firms that lend through entrusted loans (or other shadow banking instruments) are more likely to fund firms that operate in similar sectors. Our findings suggest that regulation may have backfired and, rather than reducing risky firms’ access to RMB denominated credit, it may have created incentives for moving to even riskier dollar denominated loans. Note 1: All data are from the BIS International Security Statistics available at https://www.bis.org/statistics/secstats.htm?m=6%7C33%7C615. Acharya, V., Cecchetti, S., De Gregorio, J. Kalemli-Ozcan, S., Lane, P., and Panizza, U. 2015. “Corporate debt in emerging economies: A threat to financial stability?” Committee for International Policy Reform, Brookings Institution, Washington DC. Alfaro, L., Asis, G., Chari, A., and Panizza, U. 2017. “Lessons unlearned? Corporate debt in emerging markets.” NBER Working Paper 23407. Bruno, V., and Shin, H. S. 2017. “Global dollar credit and carry trades: A firm-level analysis.” The Review of Financial Studies, 30(3), 703-749. Caballero, J., Panizza, U., and Powell, A. 2015. “The second wave of global liquidity: Why are firms acting like financial intermediaries?” CEPR Discussion Paper 10926. Chen, K., Ren, J., and Zha, T. 2018. “The nexus of monetary policy and shadow banking in China.” American Economic Review (forthcoming). Huang, Y., Panizza, U., and Portes, R. 2018. “Corporate foreign bond issuance and interfirm loans in China,” NBER Working Paper 24513. Shin, H. S., and Zhao, L. 2013). “Firms as surrogate intermediaries: Evidence from emerging economies.” Asian Development Bank, December. Song, M. and Xiong, W. (2018) “Risks in China’s financial system.” NBER Working Paper 24230, National Bureau of Economic Research, Inc.